The level of crime in many of the main urban centres is certainly rising and tourists need to be aware of the risks involved in travelling particularly in the evening hours. It is wise to use an official taxi for any journeys after dark. It is sensible not to flaunt any personal wealth and to use the hotel safety boxes for any valuables and your travel documents. The amount of crime against tourists tends to be greater in areas surrounding hotels, discotheques, bars, nightclubs and other similar establishments that cater to visitors, especially at dusk and during the evening hours. There are frequent reports of theft on city buses and such transportation should be avoided. A number of the main cities have established specialised tourist police units to patrol areas frequented by tourists. Rio de Janeiro, Sao Paulo and Brasilia all continue to experience a high incidence of crime. Throughout this huge country the state of the roads varies greatly. In many regions the roads are dirt tracks and assistance would be hard to obtain for those travelling off from the main tourists routes. Bag snatching from traffic lights occurs in the main cities. If considering hiring a car make certain that your travel insurance is sufficient. After your flight you will experience a degree of jet lag. Travelling from Europe this will be less than when you travel home but nevertheless it will still cause your body to complain for 24 to 48 hours. Try to have a more relaxing time for the first few days (and also after returning home if possible!). Be careful not to fall asleep by the pool and then awaken with sunburn which could ruin your time abroad. In any country of this size the level of medical care will vary greatly. This is particular true out side the main tourist resorts. English speaking doctors should be available but the level of hospital care can be worrisome. Make certain you carry sufficient supplies of any medication you may require for your entire holiday. Essential drugs (asthma, diabetes, epilepsy etc) should be divided for security. The hot humid tropical climate often leads to quite significant problems for the Irish traveller. Make sure you cover your head when out in the sunlight and drink plenty of fluids to replenish that lost through perspiration. Replace the salt you loose by eating crisps etc orby putting salt on your meal (providing there is no contraindication). These huge waterfalls border Argentina, Brazil and Paraguay. There is only minimal risk of malaria and so malaria prophylaxis is not generally recommended. Also, Yellow fever is not transmitted in this area but mosquitoes can abound. Sensible insect bite precautions should be followed at all times. Many tourists who visit Brazil stay in the main resorts along the southern coast. The food and water preparation in the hotels is normally excellent but eating food from street vendors is generally unwise. Shell fish (bivalve oysters, mussels, clams etc) are unwise even in a five star hotel. Check the water from the cold water tap in your room. If you can’t easily smell chlorine (swimming pool style) don’t use it even for brushing your teeth. If travelling around the country (Caribbean coast or into the Amazon regions) take significantly more care. This viral disease occurs throughout Brazil and it is usually transmitted through the bite from an infected warm-blooded animal (eg dogs, cats & monkeys). Any contact should be avoided but if it occurs treat it very seriously and seek competent medical attention immediately after you wash out the area and apply an antiseptic. The risk of malaria is significant all year throughout the Amazon regions. There is insignificant risk for those staying along the coast up as far as Fortaleza and for those remaining in this region prophylaxis is not usually recommended. 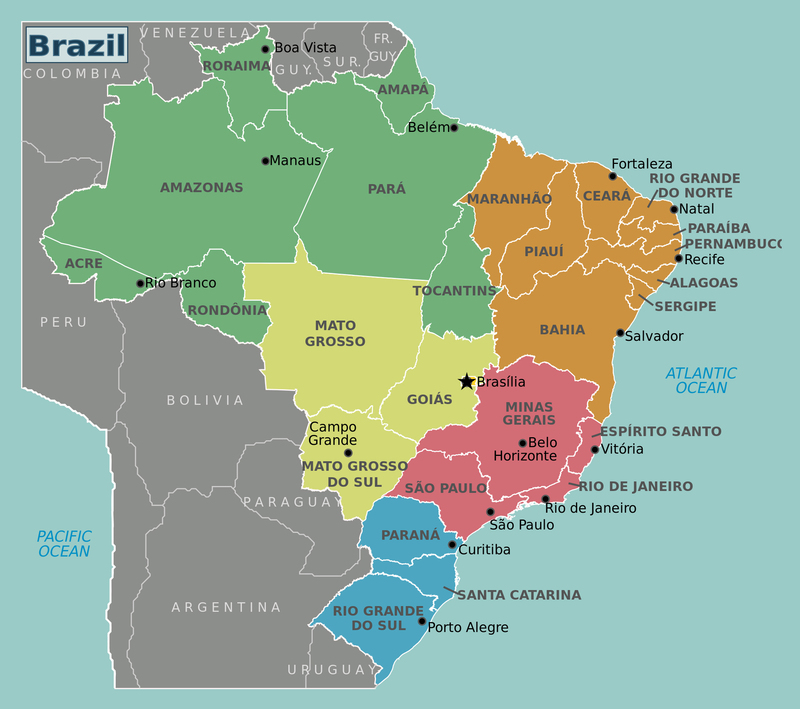 The risk in the region of Brasilia is also thought to be minimal though this is an area which has unusually experience an outbreak of Yellow Fever recently, and so the situation will require review. Mosquito Borne Diseases Apart from malaria the other two main diseases transmitted by mosquitoes which cause problems in Brazil are Dengue Fever (mainly along Caribbean Coast but has been reported much further south) and Yellow Fever (mainly in the Amazon Basin but thought to be spreading to other regions). Avoidance techniques are important at all times throughout the day. Swimming **************************************** Most of the main tourist swimming pools will be well maintained and the smell of chlorine will be evident. If sea swimming is on your agenda make sure you go where there are plenty of others and never swim alone. Look for warning signs and pay attention to local advice. Be very careful of local currents which can be dangerous. Vaccinations **************************************** The Brazilian Embassy is advising all travellers to Brazil to have vaccination cover against Yellow Fever. Also for your personal protection it is wise to consider some further vaccines. Generally we would recommend the following vaccination cover; * Yellow Fever (mosquito borne) * Tetanus (childhood booster) * Typhoid (food & water borne) * Hepatitis A (food & water borne) For those travelling more extensively or staying in the country for longer periods we would usually suggest that further vaccines are considered including Hepatitis B, Meningitis and Rabies. Summary **************************************** Many travellers to Brazil will remain perfectly healthy and well providing they follow some sensible precautions. Further information is available from either of our centres regarding any recent disease outbreaks. a resident of the Rolas favela in western Rio, and escaped on Tuesday when a wall holding them in burst when struck by a flash flood. An animal control team has been mobilized to re-capture the reptiles, the Rio environmental services office told AFP. How many were on the loose? Officials did not say. The team faces a risky task: not only must they be wary of the aggressive animals, but they must navigate streets knee-deep in water or slick with mud, dodging uprooted trees and loose power lines like the one that electrocuted a man to death near where the caimans escaped from. They also face more mundane dangers, such as being shot, knifed, mugged or kidnapped in the high-crime favela. As of Wednesday the team had been unable to enter the favela "due to the strong presence of drug traffickers," city officials said. "I saw the wall collapse and two people have already seen caimans at their front door," a local resident wrote on social media. The unusually heavy rain, which began late Monday and continued into Tuesday, has killed at least 10 people, officials said. The rain triggered flash flooding that turned some streets into raging rivers, uprooting trees and sweeping away vehicles. Heavy runoff from neighbouring hills gushed through some apartment buildings and shops, leaving behind mud and debris. In the town of Soledade, Adriano Borges Knopf lost 4 animals in less than 15 days. "We started to suspect it was not a normal thing. We noticed the animals lost their legs [weakness in legs] and did not get up any more," said the farmer. Four other cattle belonging to the producer Luiz Carlos dos Santos also died because of the problem. "It's their milk we live on. We were even planning to improve this year ," he lamented about the losses in production. The challenge now is to control the transmission of the disease affecting these cattle. Most of the animals that died were attended by the veterinarian Bolivar Camargo, who is part of a cooperative in the region. "There are people who had 10 lactating cows and ended up losing 7, so their profitability ends, right?" he pointed out. Last week, a bat was found near one of the affected properties. Technicians from the State Department of Agriculture are doing a survey to try to identify the source of these infections. In addition to injury, producers are also concerned about the transmission of rabies to humans. The disease, however, is not transmitted by the consumption of milk or meat. "They [the people] should be vaccinated if they have a very high risk, if they have suffered a bite from an animal, or had very intimate contact with an animal showing clinical signs of rabies," explained veterinarian Isadora Correa. She added: "[The vaccine] is not available to the entire population, nor would it be the case, because the risk of transmission of herbivore rabies from a bovine to a human being is fairly low." [Most likely, the bats responsible for transmitting the rabies virus are vampire bats. While these bats can and do move around, deforestation seems to upset them, causing them to move to areas where there previously has not been a problem. Vampire bats are distributed in tropical areas of the western hemisphere from Argentina to Mexico and have been responsible for transmitting rabies virus, most frequently to cattle and equine animals, and, infrequently, to humans [by bite]. Of the 3 vampire bat species, _Desmodus rotundus_ is by far the most common rabies virus transmitter. vaccination of animals upon which the vampire bats feed, or reduction of the vampire bat populations, or perhaps a 3rd option would be a combination of the 2 approaches. Eliminating vampire bat hosts is the fastest and most effective approach when vampire bat-transmitted rabies appears in an area. In areas where repeated vampire bat-transmitted rabies occurs, control of these bats has been employed in some countries. Controlling vampire bats by eliminating their roosts is extremely difficult because these roosts can be hard to find. Effective vampire bat control has been accomplished by capturing bats in mist nets when they come to feed on livestock and applying anticoagulant jelly (warfarin and similar products), which they and their roost-mates ingest on grooming. As animals can be vaccinated, it would prudent to do so immediately, as there is approximately 2 weeks from vaccination of the cattle until they are capable of mounting an immune response. In addition to vaccination, the suggestion of netting the bats and using anticoagulant jelly is perhaps equally as important. So, employing additional methods instead of only one method, would be the most prudent approach to a more rapid control of this disease from these bats. The loss of these animals to these families is huge, and this is a large outbreak needing immediate containment. Perhaps the government could send out some vaccine and additional people to help vaccinate animals and to net and coat the bats with anticoagulant jelly. Coating the bats means handling the bats, minimally, and gloves should be worn. Likewise, any bite or scratch should receive immediate medical attention and post exposure prophylaxis rabies vaccine for the individual(s) affected. Brazil is currently in the seasonal period for yellow fever, which occurs between December and May. The expansion of the historical area of YF transmission to areas previously considered risk-free led to two prior waves of transmission one during the 2016-2017 seasonal period, with 778 human cases, including 262 deaths, and another during the 2017-2018 seasonal period, with 1,376 human cases, including 483 deaths. Human cases reported so far during the current 2018-2019 period, (July 2018 to March 2019) in in São Paolo State, as well as the confirmation of a human case and epizootics due to yellow fever in the states of Paraná, and Santa Catarina mark the beginning of what could be a third wave and a progression of the outbreak towards the Southeast and South regions of the country. From December 2018 through March 2019, 75 confirmed human cases, including 17 deaths, have been reported in the states of São Paulo (62 cases), Paraná (12 cases), and Santa Catarina (1 case). Among these confirmed cases, 88% are male, the median age is 43 years, and 71% are rural workers. Between 1 July 2018 and 18 March 2019, 33 confirmed epizootics were reported, in five federal entities: São Paulo (20), Rio de Janeiro (8), Minas Gerais (1), Mato Grosso (2), and Parana (2). In the last 4 weeks epizootics have been confirmed in São Paulo and Parana states. Given the gradual geographical expansion of the epizootic wave that Brazil has faced during the last two seasonal periods, the country has had to adjust its immunization policies for yellow fever. The number of areas with recommended vaccination has increased from 3,526 municipalities in 2010 to 4,469 municipalities in 2018. In line with the World Health Organization guidelines, Brazil has adopted a single dose vaccination scheme for yellow fever since April 2017. The use of fractional doses to respond to outbreaks and the risk of urbanization of yellow fever, especially in large cities, was also adopted. This strategy was implemented in 77 municipalities with the greatest risk for yellow fever in the states of São Paulo (54 municipalities), Rio de Janeiro (15 municipalities), and Bahía (8 municipalities). As of epidemiological week (EW) 39 of 2018 (23-29 September), preliminary results of the mass vaccination campaign against yellow fever indicate that 13.2 million people were vaccinated. With respect to the accumulated doses and doses administered during the campaign, a total of 13.3 million people in São Paulo, 6.5 million people in Rio de Janeiro, and 1.85 million in Bahía states were vaccinated, which represent vaccination coverage of 53.62%, 55.60% and 55.03%, respectively. Further transmission is expected in the coming months based on seasonal patterns. Recent human cases of YF during the current seasonal cycle have been reported in São Paulo, Paraná, and Santa Catarina states in Southeast Brazil. The preliminary results of the vaccination coverages in municipalities from Paraná, Rio Grande do Sul, São Paulo, and Santa Catarina states suggests a high proportion of persons remaining at-risk and the necessity to intensify risk communications among high-risk groups. The geographical distribution of human cases and epizootics from the current and previous two seasonal cycles suggests southward movement of the virus, which presents further risk to the states of Paraná, Rio Grande do Sul, and Santa Catarina. Furthermore, these areas have ecosystems favourable for yellow fever transmission and borders with other countries such as Argentina, Paraguay, and Uruguay. During the previous season cycle, human yellow fever cases were reported among travellers, though to date, most imported cases have been reported in countries where the vector are absent (or absent during winter). These reports illustrate the importance of maintaining high levels of awareness, especially for international travellers from areas with favourable ecosystems for yellow fever transmission. To date, yellow fever transmission by Aedes aegypti has not been documented. More recently, an investigation conducted by the Evandro Chagas Institute reported by the Brazil Ministry of Health revealed the detection of yellow fever virus in Aedes albopictusmosquitoes captured in rural areas of 2 municipalities in Minas Gerais (Ituêta and Alvarenga) in 2017. The significance of this finding requires further investigation. The last documented outbreak of urban yellow fever in Brazil was recorded in 1942. The sylvatic yellow fever virus is transmitted to monkeys by forest dwelling mosquitoes such as Haemagogus and Sabethes spp. Humans who are exposed to these mosquitoes can become infected if they are not vaccinated. In entomological studies conducted during the 2016-2017 outbreak in some of the affected states, isolated Haemagogus mosquitoes were found to be positive for yellow fever, indicating predominantly sylvatic transmission. WHO continues to monitor the epidemiological situation and review the risk assessment based on the latest available information. Currently, based on available information, WHO assesses the overall risk as High at the national level, Moderate at the regional level, and Low at the global level. On 25 January 2019, PAHO/WHO alerted Member States about the beginning of the seasonal period for yellow fever and therefore, the highest risk of transmission to unvaccinated humans. Thus, PAHO/WHO advises Member States with areas at-risk for yellow fever to continue efforts to immunize the at-risk populations and to take the necessary actions to keep travelers informed and vaccinated prior to traveling to areas where yellow fever vaccination is recommended. Yellow fever can easily be prevented through immunization, provided that vaccination is administered at least 10 days before travel. A single dose of yellow fever vaccine is sufficient to confer sustained immunity and life-long protection against yellow fever disease: a booster dose of the vaccine is not needed and cannot be required of international travelers as a condition of entry. The vaccine has been used for many decades and is safe and affordable. Yellow fever (YF) is an acute viral disease transmitted by mosquitoes infected with the yellow fever virus with a high case-fatality rate among patients presenting with the toxic phase of the disease. In 2018 Brazil launched mass YF vaccination campaigns and preliminary results of the campaigns indicate 64.2% of vaccination coverage in São Paulo, 55.6% in Rio de Janeiro and 51.7%, in Bahia states . Suboptimal vaccine coverage implies that herd immunity is not reached and that a high proportion of persons remain at-risk. Human cases of yellow fever during the current seasonal cycle have been reported in the states of São Paulo, Paraná and Santa Catarina in Southeast Brazil, with probable sites of infection in municipalities which had no confirmed epizootics or human cases due to yellow fever in the previous 2 seasonal cycles. In the state of Paraná there had been no reported human cases since 2015 and in the state of Santa Catarina none since 1966. The geographical distribution of human cases and epizootics from the current and previous two seasonal cycles suggest southward movement of the virus where there are ecosystems favorable for yellow fever transmission and an area bordering other countries (Argentina, Paraguay, and Uruguay). However, so far, no YF human cases have been reported outside Brazil, in link with the current outbreak. WHO does not recommend any restrictions on travel and/or trade for Brazil based on available information on this event. Infectious disease physicians in the state health network of the Rio Grande do Sul Federal University UFRN) did not confirm that the disease, having symptoms similar to chikungunya [virus infection], observed this past week in 140 residents of 2 neighborhoods of Tirol and Petropolis in Natal [state] is in fact chikungunya. Blood tests done on Sat 23 Mar 2019 on samples from 6 individuals detected the presence of that virus, but the specialist physicians do not discard other hypotheses. Occurrence of this number of cases in less than one month is considered an outbreak. Investigations were done on 73 cases in order to identify whether there is a mutation of that virus or a new virus in circulation in Natal. "The fact of a confirmation of chikungunya [virus infection] in some of the cases does not close the case [outbreak]," stated Kleber Luz, an infectious disease physician at the Federal University of Rio Grande do Norte. All are transmitted by the _Aedes aegypti_ mosquito [not correct. See comment below. - ProMED Mod.TY]. The majority are women with a median age of 58 years. No children were identified with the disease. The majority are residents and workers in the Tirol neighborhood, a locality in which the numbers of _Aedes aegypti_ mosquitoes increased according to the municipal surveillance team. The most frequent symptoms are pain in the joints, fever and rash. It is the unusual nature of the symptoms that impede the diagnosis as chikungunya [virus infection], Zika [virus infection] or dengue. For example: the majority of the patients examined present with arthralgia, sores in the mouth and fever, which are common in chikungunya cases, but also have a rash which is common in Zika cases, but with strong itching; a symptom that the new patients have is itching, but not to the point of troubling them as in Zika [virus infections]. The symptoms of the new cases are less intense than the known diseases and appear more rapidly. Most of the patients feel pain in the soles of their feet on the 1st day [of illness]; when this pain happens in known chikungunya cases, generally it appears during the 2nd week. "A patient told me, 'Doctor, when I decelerate (step on the clutch) of the car, it hurts a lot.' This pain of the soles of the feet only appears at the end of [chikungunya] disease," said Kleber. This difference does not mean that this could be a new virus. During the meeting, the infectious disease physician Andre Prudente called attention to the "spectrum" of symptoms that arboviruses produce. "The big problems with arbovirus diseases is that the spectrum of symptoms is very wide. Some patients have intense pain, and others do not. And this can be with the same disease [virus]," he explained. "Some symptoms seem to be a milder chikungunya," a caveat offered by infectious disease physician Kleber Luz. He accredits this to the hypothesis of a modified virus but will not discard the others [hypotheses] until the end of the investigation. "That is to say, laboratory tests, and until then, we will continue to work with all the hypotheses. I believe that it is chikungunya, but not only that." The specialists discussed the progress of the studies. - A modified chikungunya or other virus is circulating or present in the people. This hypothesis takes into consideration that the chikungunya virus could have had a modification from another [chikungunya] virus in circulation. This could explain why patients had chikungunya [virus] present in their blood but with symptoms different from the disease. Mayaro arbovirus, present in Brazil but never identified in Ro Grande do Norte Cases of Mayaro, an arbovirus similar to those in Natal, are related to Goiania. The symptoms are similar and [the virus occurs] near cities with forests [as is the case with Goiania and wetlands; in Natal Dunas Park) which is a common factor. [Mayaro virus was 1st isolated by Charles Anderson and his colleagues during the 1950s from humans with febrile illnesses in Trinidad. Mayaro virus has since been identified in the Amazon and other tropical regions (Trinidad, Suriname, French Guyana, Brazil, Peru, Bolivia, and Venezuela) and more recently in Haiti. In South America, it has been shown mostly to be transmitted by _Haemogogus_ mosquitoes. However, the urban mosquito _Aedes aegypti_ has now been also shown to be an experimental vector of the virus and was recovered from this mosquito captured in Mato Grosso state. [Regarding unidentified febrile disease in Rio Grande do Norte, 23 of 34 samples examined suggested CHIKV infection (there is no information about if the tests performed were serological and/or biomolecular tests). On 25 Mar , it was informed by local public health authorities that there is the circulation of all DENV serotypes, ZIKAV, and CHIKV. The director of the Natal Health Surveillance Department said, "I do not consider that [the disease] is any mystery. We have 6 types of arboviruses circulating in the [Tirol] municipality: dengue types 1, 2, 3, and 4; Zika virus; and chikungunya [virus]." ([in Portuguese]). The weekly epidemiological bulletin released on [Thu 21 Mar 2019] by the State Department of Health reports that the number of cases of yellow fever rose in Parana. Last week [week of 11 Mar 2019] there were 8 confirmed cases and now there are 12 in the updated bulletin, corresponding to the period from 1 Jul 2018 to 20 Mar 2019. According to the Secretary of State for Health, Beto Preto, the 22 regional health centers of Parana are involved with the intensification of vaccination. "We reaffirm the guidance that being immunized is the only way to protect against the disease. Everyone aged 9 months to 59 years should receive the vaccine," he said. He adds that the Health Department is actively pursuing people who have not yet been immunized and live in areas of difficult access, as well as reinforcing guidelines on the importance of vaccination at community events. He also promoted the training of teams for vaccination at the Hospital do Trabalhador, in Curitiba, and in the 3rd Health Regional of Ponta Grossa. The 12 confirmed cases of the disease are in Antonina, Morretes, Adrianopolis, Campina Grande do Sul, Curitiba, Piraquara, and Sao Jose dos Pinhais. Of the patients, (92%) are males, with a mean age of 36 years; 3 of them are rural workers. There is one confirmed yellow fever death in Parana in the 1st week of March [6 Mar 2019], with residence and probable place of infection in the municipality of Morretes. The municipalities with the highest incidence of notifications are Paranagua (55), Curitiba (33), and Sao Jose dos Pinhais (30). The Capital reported 8 more notifications than the bulletin of the previous week and Sao Jose dos Pinhais 7 new cases. In total, there are 224 notifications and 61 cases under investigation, in addition to the 12 confirmations. Monkeys: the State Department of Health also intensifies disease surveillance and death of monkeys, and reaffirms that they do not transmit the virus. On the contrary, they provide an alert for the circulation of the virus, since in the regions where these infected animals appear, the transmitting mosquito is present. This week's newsletter [week of 18 Mar 2019] shows 4 confirmed epizootics [monkey cases] and 12 under investigation and 2 new areas recorded occurrences: Paranagua and Sao Jose dos Pinhais. The municipalities of Antonina and Morretes had already reported the disease in monkeys. Vaccine: in the period from 1 Jan to 19 Mar 2019, around 445,000 doses of the yellow fever vaccine were applied throughout Parana in the population aged 9 months to 59 years.